Rob Conery has released a new book called The Imposter’s Handbook for those in the software industry who don’t have a strong background in computer science fundamentals. I haven’t read the book so I can’t comment on what it covers, but the concept has me reflecting on my own similar experience. While I did attend some university, I only finished about half of my computer science degree before I dropped out. At the time, I didn’t think I had missed out on anything because I had already taught myself everything I had encountered in school up until that point; I was always a semester ahead of my course work. I realize now that I was pretty close to the promised land of computer science because I had just hit Big-O notation though at the time I thought it was completely pointless. At the time, I was somewhat correct, but looking back now I realize how wrong I was. This idea still resonates with many other self-taught developers though. The easiest place to see this is the criticism of technical interviews and their focus on rote data structure / algorithm questions. Often the counter-argument is “I don’t need to know this because I can just google it”, which is a fairly valid response. So why, exactly, should you care about computer science if you are already a good developer? Well, you don’t, to an extent. You can be a succesful developer, at least for a while. I was successful for years before I started diving deep into computer science on my own. I wasn’t some prodigy, I was just riding the effective application of computer science through my use of a DBMS. In fact, a large number of developers can, and are, successful because those fundamentals are baked into the frameworks that they are using. At some point, though, you will start hitting scaling problems as you continue to be successful. Often times, the scale may not be as much as you would like. Sometimes, it will happen because you finally land that big client. The classic example of this is you have a component that has some sort of double loop in it that works great with all of your existing clients who have a hundred items of something, and then you get that client who has a thousand, perhaps even ten thousand items, and everything suddenly starts falling over. This is why many companies focus on ensuring that developers have a good grasp of data structures, algorithms, and their space / time complexity analysis during the interview process; they have hit the point where they can’t scale further without doing things right. Furthermore, they can’t afford to have people writing code that, when released, will immediately fall over under load. So, if you’ve made it this far, I now make an appeal to you, reader. If you don’t have a strong background in computer science, start today. You don’t need it, but it can only make things better. Now is the greatest time to do such a thing because there’s never been better access to that information. Whether you read a book, take an online course, or read blogs, there’s a multitude of information out there for a reasonable price. Out of the box, posh-git uses a red color that's a bit hard to read against most background colors. All hope is not lost, because it's very easy to fix. The console on windows has some named colors built-in and posh-git is configured to use DarkRed. While we can’t change the named color that PoshGit uses, we can change the color that the console displays. To do this, simply right-click on the powershell icon, then select properties from the drop down menu. It should be pretty clear which color in the row of colors is dark red, but if it isn’t then it is the fifth color from the left. 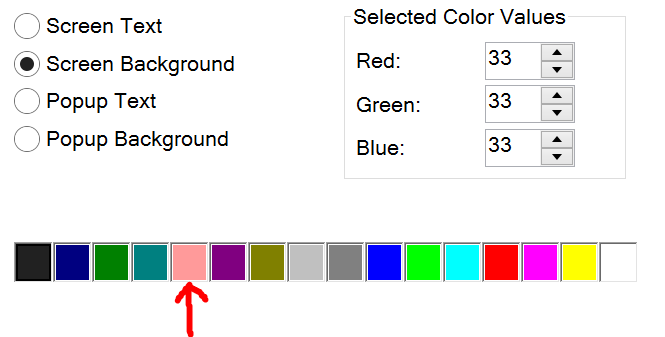 Once you select the dark red color, you can the selected color values to a more humane color. As can be seen in the screenshot, I’ve chosen a salmon color (R: 255, G: 154, B: 154) which goes well with my black color. Now, likely you’re still on Screen Background and the console background has changed to a salmon color, so just remember to re-select the previous background color before you hit Ok.
That’s it. Now hopefully you’ll have a more humane posh-git experience.